Dzhovani Gospodinov stars in the Balenciaga Fall/Winter 2014/2015 ad campaign. The advertorial is lensed by photographer Josh Olins who captures the model in a bed of pink-hued flowers and leafs. Dzhovani poses in the luxury label’s line of elegant suiting, sports-themed separates and impeccably tailored coats that are layered together to create a classically sophisticated look. 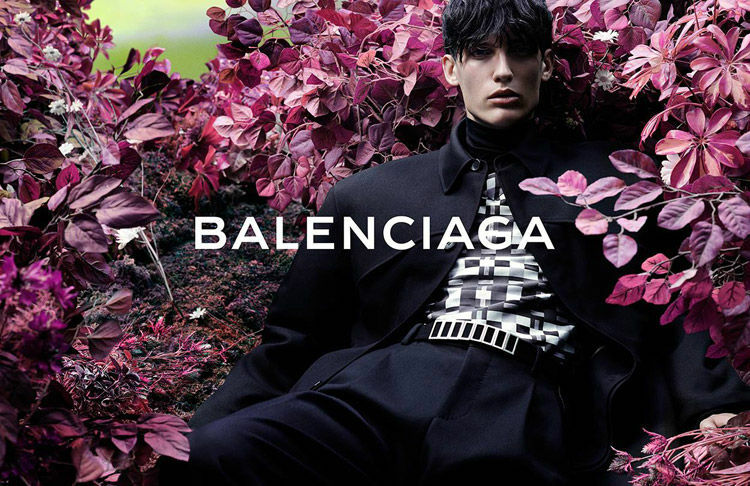 The Balenciaga Fall/Winter 2014/2015 ad campaign juxtaposes the label’s clean-cut menswear pieces with a botanical backdrop that infuses this image series with a much-needed dose of color. The campaign highlights a range of urban looks that are designed for the style-conscious city dweller. The looks make a seamless transition from day to evening and marry aesthetics with comfort and practicality for their wearer.